Skilcraft Double Pocket Portfolio - Letter - 8.5\" x 11\" - 0.38\"
Double-pocket portfolios hold papers, samples or forms in two pockets. Each pocket expands 3/8". Stapled, scored center help papers lay flat and stay in place. 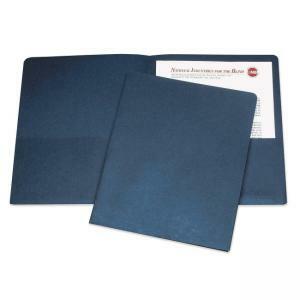 Each portfolio features leather-grained, coated paper for covers and holds letter-size sheets. Portfolios are made with a minimum of 30 percent post-consumer recycled material and meets CPG Guidelines.